I bloody LOVE crispy duck pancakes. Everything about them is a treat, from the sweet succulent duck meat, to the rich plum sauce combined with the crunchy refreshing burst of cucumbers and spring onions. Not only that, but it's a fun experience - diving in and assembling the pancakes yourself, and don't tell me you're not totally impressed by the waiter who, armed with only a pair of forks, turns half of a cooked bird into a pile of meat snacks in a matter of seconds. Majestic. Look at that...look at how gorgeous that looks. I bet you'd like to know how to cook that right? Right? Go on then. Find yourself a duck. I used a crown as there was only two of us, and that ended up being plenty. That's not to say we didn't finish it all....but it was still plenty. Preheat the oven to about 170C, stick your duck into a roasting tray and sprinkle liberally with Chinese Five Spice, salt and pepper. Bang it in the oven for about 2 hours, basting it occasionally - after an hour or so your kitchen will smell like a Chinese restaurant...YOU'RE WELCOME. After about 2 hours, crank the heat up 200C for an extra 15 minutes to crisp it up, and that's it! About half an hour into the duck's cooking time, get started on all your other goodies. Plum sauce couldn't be easier to make, and there's nothing quite like homemade. 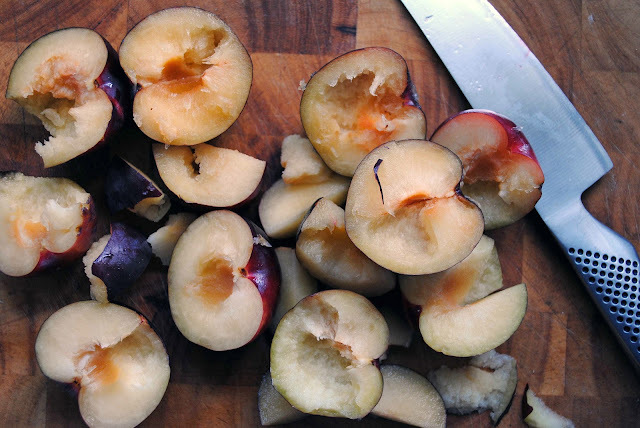 Grab half a dozen or so plums, slice them in half and remove the stones. Throw them into a saucepan with about 5 tablespoons of sugar, 2 tablespoons of soy sauce, half a teaspoon of Five Spice and the same of chili powder. Add a splash of water and bring it to the boil, then reduce to a simmer on a low heat. Leave the plums for about 45 minutes and they'll just naturally all break up into a nice jammy sauce. If it gets a bit too watery, turn up the heat, a bit too thick just add some water. Simples. Leave the mixture to cool and this is what you're left with...look at those chunks of plum in that dark sauce. I reckon any leftover would work a treat on toast...you'd have to find some leftovers first though I guess...a rare occurrence in this household. Can't have Peking duck without your cucumbers and spring onions, and you can't have a Fatboy without making far too much food. If you want to follow my lead, slice up what looks like a reasonable amount...then spend 5 minutes staring at what's left and eventually slice that up as well. Hell, if nothing else it's salad fodder for the week ahead. I decided to make my own pancakes. Partly because I couldn't find any that were suitable in the store, and partly because I'm a bit of a badass. (I'd say perhaps 90% the former and 10% the latter...and that might be flattering.) Anyway, this is good lager...it has the Fatboy stamp of approval. Super easy pancake mixture - combine 300g of plain flour with 1 tablespoon of sugar, then slowly mix in about 240ml of boiling water. Stir with a fork until it starts holding together, then when you're feeling brave enough, tip it out onto a floured work surface and give it a good knead. When it's ready the dough should be smooth and not sticky. Roll your dough out nice and thin, then using a cookie cutter or upturned glass cut out as many circles as you can. When you've got scraps, mix them together, roll them out again and make some more circles. Brush them with a mixture of olive oil and sesame oil, just on one side. Sandwich your circles together so that you have two pancakes on top of each other, with the oil mixture in the middle. To cook, just gently these pairs out flat (they won't stick because of the oil) and then fry in a non-stick frying pan. They only need a minute or so on each side, and you'll be able to pull them apart when they're done cooking. So two becomes one, which becomes two again. Maths, cooking and a bit of magic. Again..YOU'RE WELCOME. And that, my friends, is the whole shebang. By now your duck should be ready to come out of the oven - just stick a couple of forks in there and tear it to shreds, being sure to sample as much as possible before it reaches the table. Personally I tend to take a pancake, spread some plum sauce on, pile a load of duck on top and then add the onions and cucumber. Sometimes I go duck first, then plum sauce, and THEN onions and cucumber. Whatever you do, don't put the onions and cucumber on, followed by the plum sauce and then the duck...that's mental. ENJOY! brilliant recipe, only (slight) change I made was to add a star anise to the plum sauce - try it, it's real good!